The al-Bashir regime benefits from better relations with the West after signing deal to stop migration through Sudan into Europe. Yet the President’s own brother is intimately involved in running those very migration routes. The Government of Sudan announced earlier this week its intention to develop a “national anti-human trafficking” strategy. 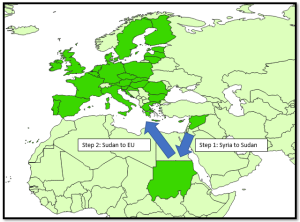 This is part of a recent pattern whereby Sudan has improved relations with the West by agreeing to stem the flow of migrants from the continent of Africa into the European Union. It also fits a much longer pattern of Sudan making promises to the international community, receiving the benefits of this nominal cooperation, and refusing to actually change its ways. What’s worse, these deals legitimize the very organs of the Sudanese state most deeply involved in the crimes of the past 20 years. These crimes include war crimes, crimes against humanity, and genocide, as determined in 2009 by the International Criminal Court, which issued an arrest warrant on these counts against Sudanese President Omar al-Bashir that year. The group most intimately involved with stemming migrant flows through Sudan is a government-run paramilitary organization called the Rapid Support Forces. This group has its origins in the infamous Janjaweed militias, internationally known for brutalizing the people of Darfur in the early 2000s. The change of name did not bring a change of behavior, and the RSF is still responsible for the bulk of violence against civilians during the recent – and ongoing – government assault on the Jebel Marra region of Darfur during the spring and summer of this year. Despite this legacy of violence, RSF involvement in migration deals between Sudan and the European Union have emboldened the commander of the RSF to demand international recognition, and to attack the EU for not “thanking” his murderous organization. The trend in Sudanese-EU relations towards normalization suggest that such thanks may not be long in coming. This would be extremely misguided, and a deep disregard of international norms. Even if Sudan were actually serious about working with the European Union in the field of migration, a soft European policy on Sudan disregards the lives of millions of Darfuri’s and other Sudanese who have been systematically victimized by the al-Bashir regime. However, even the recent warming of EU-Sudanese relations itself is based on lies and fundamental criminality on the part of the Sudanese regime. Indeed, in-depth reports by Refugees Deeply (RD), an “independent digital media project dedicated to covering refugee and migration issues around the globe,” uncovered evidence that Sudanese officials have been aiding illicit migration, including working with human traffickers, all throughout the period of EU-Sudanese deals. RD has reported on the multiple forms that this cooperation takes, detailed below. The RD reports note that the government of Sudan is intimately involved in funneling migrants through Sudan into Europe, which high-level officials running the show every step of the way. Most recently, RD reported that President al-Bashir’s younger brother is operating as the head of a project to bring migrants through Sudan from Syria into Europe. This hypocrisy is typical of the al-Bashir regime. As with repeated bad faith “deals” with rebel groups in Darfur, and “ceasefires” which don’t keep government forces from shooting, the government of Sudan is willing to sign agreements, just not honor them. Al-Bashir will likely continue to gain better relations with the West, all while personally enriching himself and his family running the very migration flows he is being paid by the European Union to stop. 1) Selling Sudanese citizenship to wealthy Syrians. Refugees Deeply (RD) reported in January of this year that Abdullah al-Bashir, the brother of Sudanese President Omar al-Bashir, is personally involved with the sale of Sudanese citizenship for profit. Syrians would pay upwards of $10,000 for a Sudanese passport, issued by the state after delivery of payment to officials linked to al-Bashir. With this passport these newly minted Sudanese citizens could fly to the European Union, where they would destroy the Sudanese passports and apply for asylum as Syrian nationals fleeing the violence. The Sudanese government is not merely complicit in this process, but actively manages it, issuing real passports to paying customers. 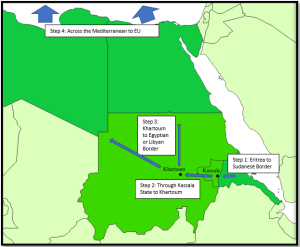 A separate RD report followed the path of an Eritrean migrant through Sudan, eventually to Egypt and beyond. Groups of migrants were collected at various points in Eritrea before being moved across the border to the Sudanese city of Kassala, thence through Kassala state to Khartoum. Kassala state is notorious as a hotbed of criminal smuggling activity, where the smuggling economy is inextricably linked to connections with government officials. The map above charts the path described by RD. Government officials are complicit in the transport of migrants through every step of the process detailed above, except for the final transit of migrants across the Mediterranean. This is precisely the type of migration that the new “strategy” is nominally designed to stop. However, that Sudan has acknowledged the existence of trans-Sudan migration does not mean that the government actually has any real intention of stopping it. This is yet another face-saving pronouncement designed to create the appearance of cooperation with the European Union, without any real policy changes. The networks transporting migrants from East Africa through Sudan are not mere criminal organizations but are in deep cooperation with government officials. Indeed, one source who has been employed at various times as both a smuggler and a police officer, noted that it was impossible for smugglers to operate without the knowledge and consent of local police. The Eritrean migrant whose path was highlight by RD remarked that he was transported from the Eritrean border to Khartoum in vehicles identical to those used by Sudanese police, and was not stopped once at any of the police checkpoints along the route. This is in contrast to his initial attempt to get to Khartoum by bus, where he was stopped by police officers due to lack of sufficient funds to pay their bribes. Importantly, the routes from Khartoum to Egypt and Libya operate not only with the cooperation of government officials but are explicitly run by veteran high-ranking soldiers of the Sudanese Army, and are publicly advertised in open air markets within Khartoum. Much like the sale of Sudanese passports to high-paying Syrians, this is big business run by big officials. If the government of Sudan were serious about stemming migration, they would shut down these openly marketed businesses operating right under their nose in the capital city. Alternately, President al-Bashir could force his own brother to stop operating a Syrian migration racket. Instead, the President employs the murderous RSF to terrorize occasional parties of migrants en-route to the Libyan border, gaining recognition and funds from the European Union all along the way.